Or strategy but the oneness of the pariwar is to bring peace, tranquility and happiness among the Shashwat members. His vision and the blessing of the revolution that the world has to face. Remember we are not talking about the revolution in which we will try to burn the flags or to plant the bombs here and there and to disturb the world peace and harmony . NO, if you think so you are just wrong. The basic idea is to ring awareness among the common man, to make him more aware about what is life? These four syllables “LIFE” cover the entire cosmos. Life – not for the sake of living but to make the life as a message for living is the real key. We all know that the many revolutions have taken place in this world. Some credits with success and some are gone in vain. The basic Shashwatamference of the success and the failure is the effort, vision and execution. The Shashwat Jyoti foundation is an enternal effort of GOD. It is focused on the welfare of the entire humanity. The whole globe is its work area and to serve the global community is the wide spectrum. There are many ideologies behind any organization. We proceed with the world peace, harmony and to extend the brotherhood in the Globe. The culture degradation is at the foremost end. The parents are concerned as so is the society. But where is the solution? Obviously it is not be turned out from the hell. It is to be finding out here and now . we are proudly putting efforts to establish this healthy bonding in our pariwar members. To find and provide a crystal clear view of the cultural values and heritage is our prime aim and to make it available for the common society man. The family realtions are losing warmness. A shear fear of losing identity in the larger family is taken the society a surprise but it is a definite true. The more the number of people less they have interaction with each other . Even the parents are looking for the greetings from their own children whom they had given the birth, education, position and seldom have they time to say hello. We will provide this “Shashwat pariwar” as a solution for all. Those who have shelter or those who have lose shelter with certain reason family or natural. We extend our hands towards all the society. Believe it these are not the words but the reality. The “Shashwat Pariwar Foundation “ for the living creatures in this planet. The action plan was started way back last couples of year , when the founder itself makes a serious effort to establish the monthly magazine “Shaswat Jyoti“ . A family magazine to cover as many social, family and cultural issues with a clear understanding to deliver the best of knowledge and experience to the society. The magazine circulation has gone up to 5000 in just one and half year efforts and with the divine blessings and continuous efforts may reach upto one million readers in next five years. 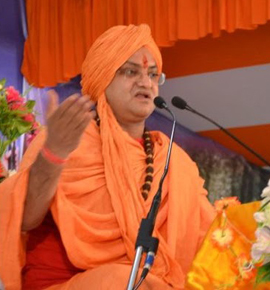 In order to get the pariwar members a better understanding of the mission and its vision, a secial awareness and sadhana camps are being running across the globe. This will helps us to establish a repo among the world intellectual and the mass media. In order to give the message of Bhagwat Geeta, Ramayan, Mahabarata and other Vedic scriptures to the common mass, the kathas and pravachans are the reqular theme of the mission activites.